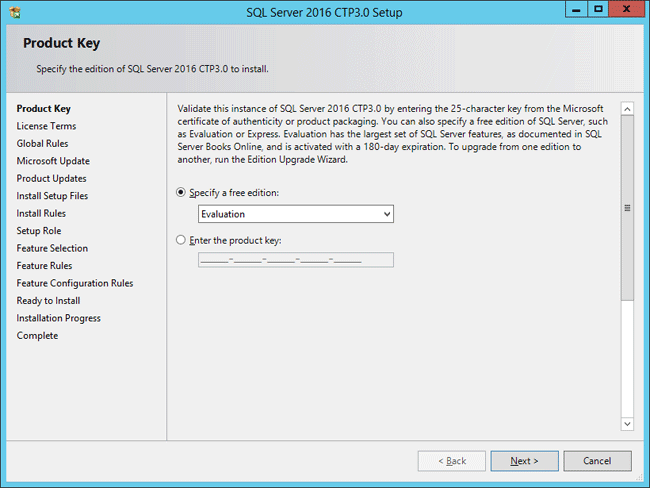 Lost SQL Server 2016 product key from an installed instance? 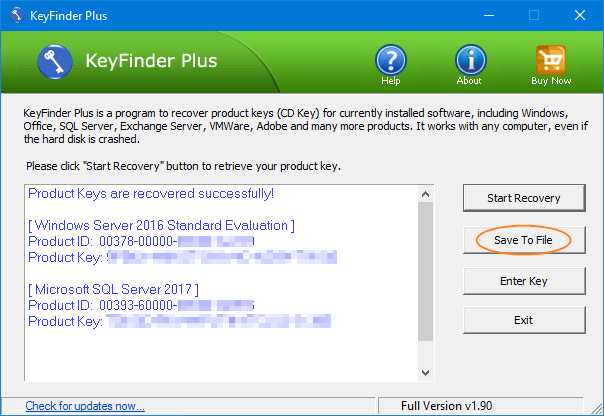 When you need to reinstall SQL Server or move the license to a new machine, you can use KeyFinder Plus to decrypt and locate SQL Server product key stored in the Windows registry. 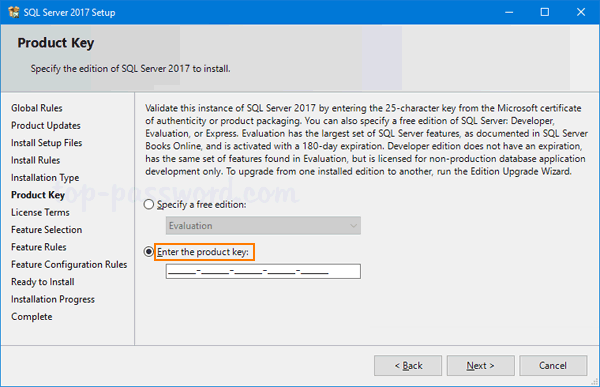 This tutorial will walk you through the steps to find SQL Server 2017 / 2016 / 2014 product key from an existing instance. 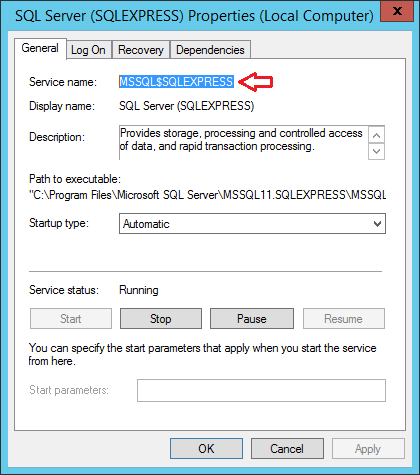 How to Find SQL Server Product Key from an Installed Instance? To begin with, download and install KeyFinder Plus on the server running a SQL Server instance. The program comes with a neat and pretty simple interface. Just click on the Start Recovery button and you’ll see a list of options for recovering product keys from local machine, unbotable system or network PC. 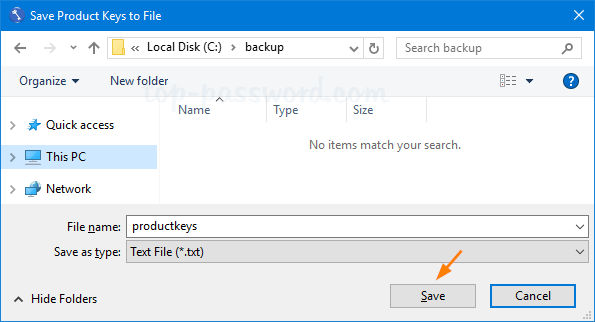 Once you have chosen the first option, it will quickly find out product keys for all editions of SQL Server, Windows, Office and other softwares installed on your local computer. If you want to write down or print out the product keys so you can access them later, click on the Save To File button. We’d recommend saving to the desktop for easy access. Afterwards, you can open that file with your preferred text editor and print it out. 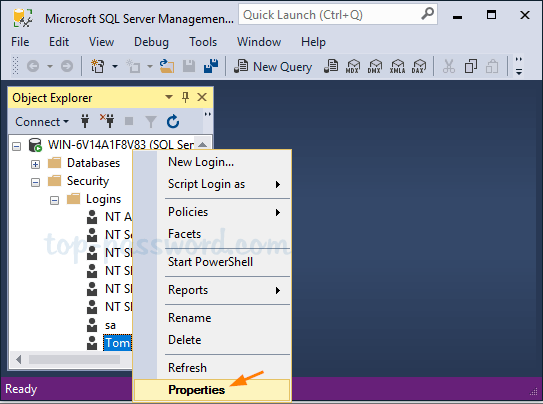 Finding lost SQL Server product key is as simple as that! 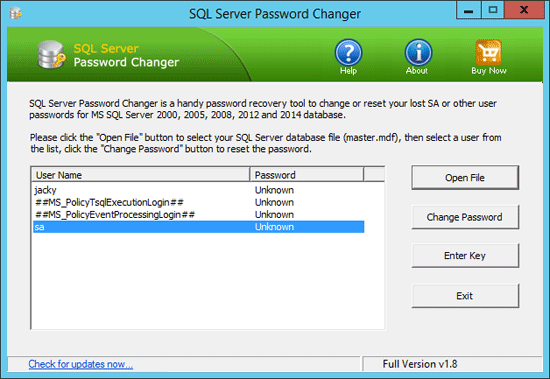 In this tutorial we’ll show you the simple ways to force users to change password at next login in SQL Server 2017 – 2008, so they can set a new password not known by the administrator. Additionally, passwords they choose are less likely to be forgotten. 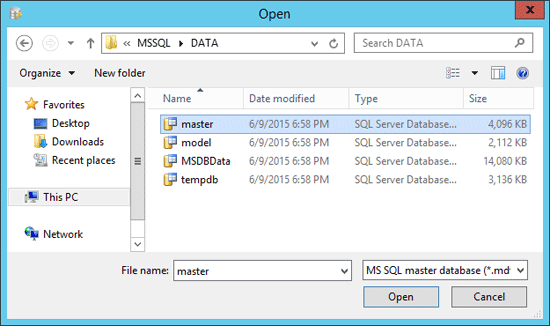 Open up SQL Server Management Studio and connect to your database. 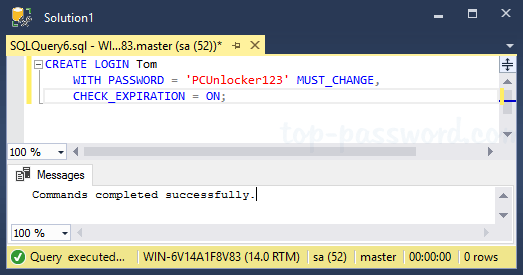 Under the Object Explorer tree on the left, expand to Security -> Logins. Right-click on a user you want to modify and select Properties. By default, the “User must change password at next login” option is greyed out. In order to access this option and force a password change, you need to change the password. After entering the new password, you can then check the “User must change password at next login” option, click OK to apply your changes. SQL Server allows a maximum of 32,767 user connections. In this tutorial we’ll show you how to find out the number of connections to a database in SQL Server, and restrict the number of connections to a SQL Server instance. Click the Connections node on the left page. 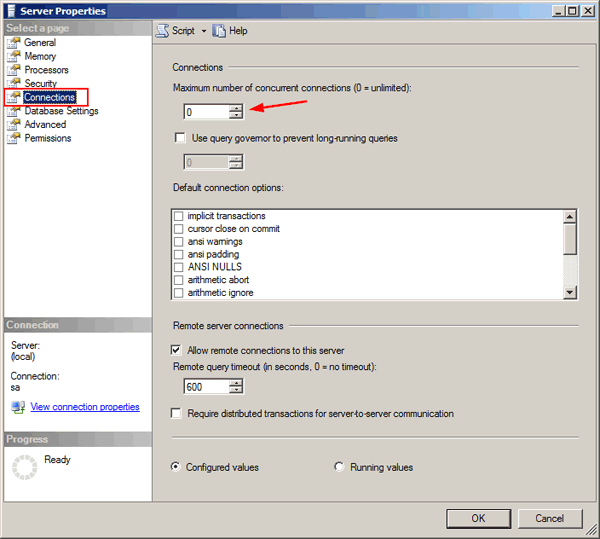 Under Connections, in the Maximum number of concurrent connections box, type or select a value from 0 through 32767 to set the maximum number of users that are allowed to connect simultaneously to the instance of SQL Server. Click OK. 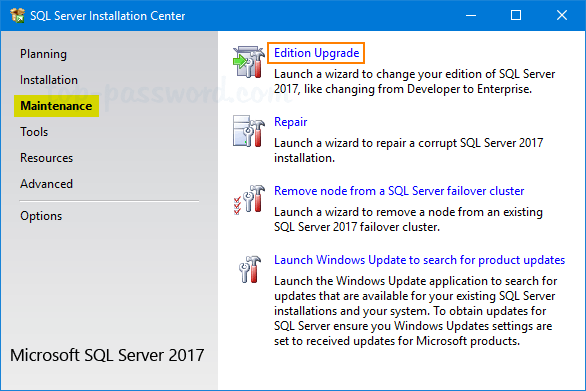 Restart SQL Server to apply your changes. 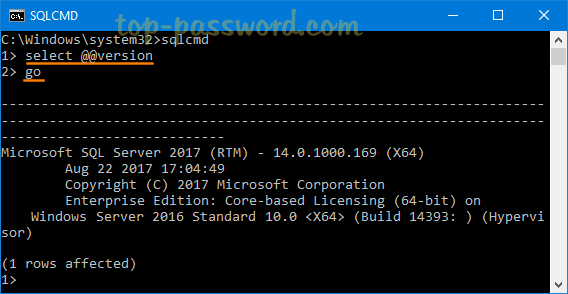 How to stop a local SQL Server instance from command line or PowerShell? 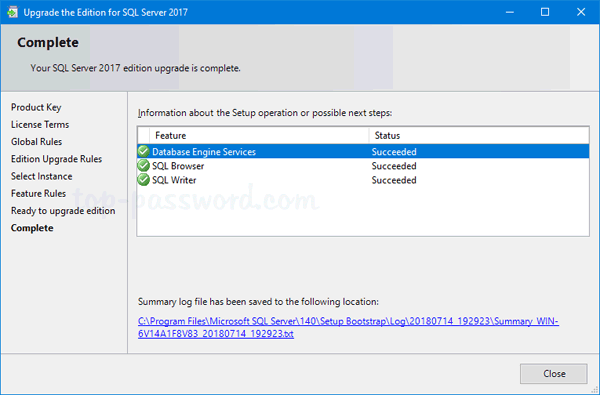 In this tutorial we’ll show you 5 simple ways to stop or start SQL Server service in SQL Server 2016/2014/2012/2005. Press the Windows + R keys to open the Run box. Type services.msc and press Enter. This will open the Microsoft Services console. 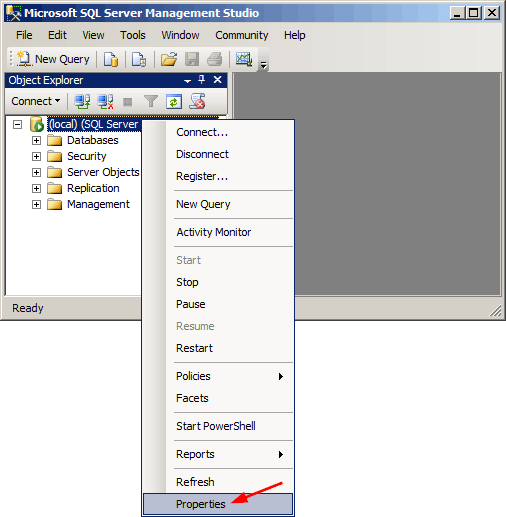 Find the service called SQL Server (instant name) and then double-click on it. 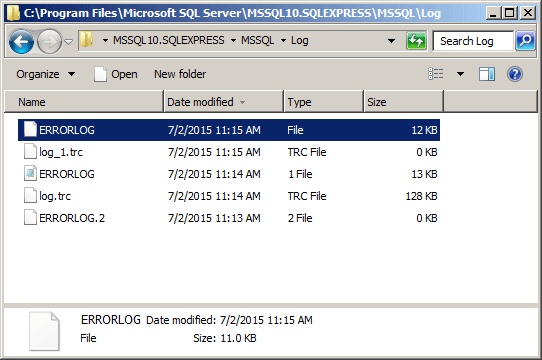 In the Properties dialog box, you can see that the service name of my SQL Server instance is MSSQL$SQLEXPRESS. 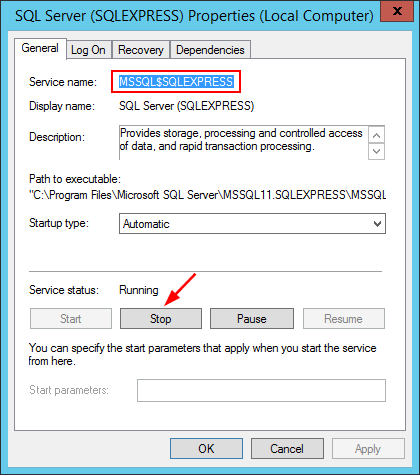 From there you can click the Stop button if your SQL Server service is running, or click the Start button to get the service up and running. 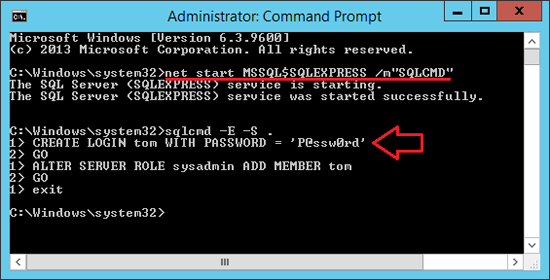 To stop a named SQL Server instance, type the following command. Replace SQLEXPRESS with the instance name. 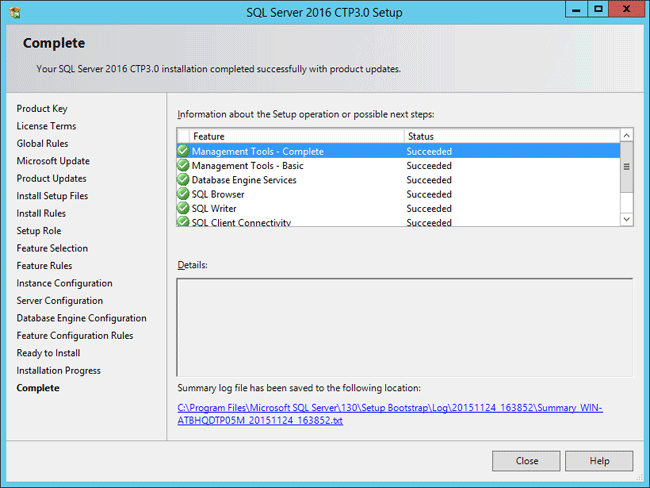 To get started, you need to open SQL Server Configuration Manager. In Windows Server 2008 or 2003, you can click Start > Programs -> Microsoft SQL Server > Configuration Tools > SQL Server Configuration Manager. 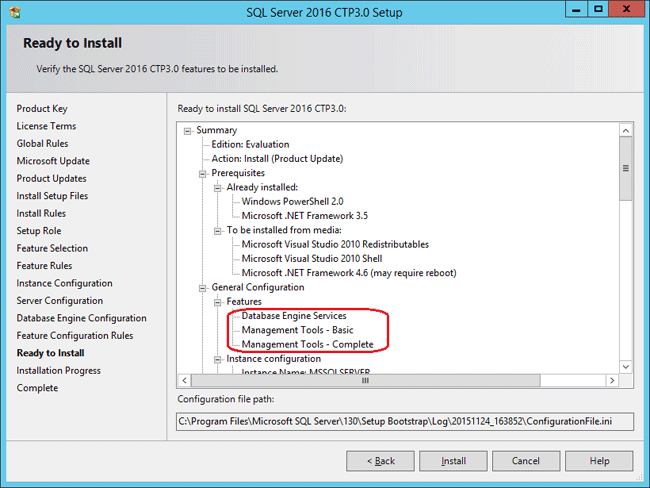 In the left pane of SQL Server Configuration Manager, click SQL Server Services. We can see all services in right pane. 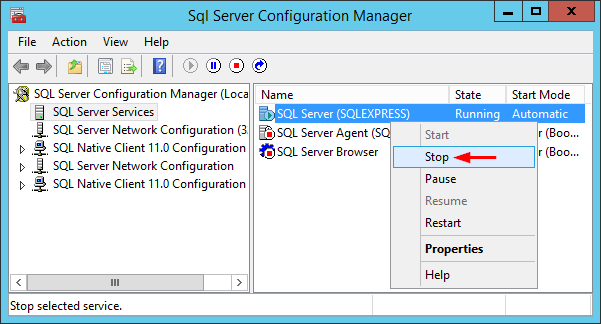 Right-click on SQL Server service and you can then select Stop or Start from the context menu. 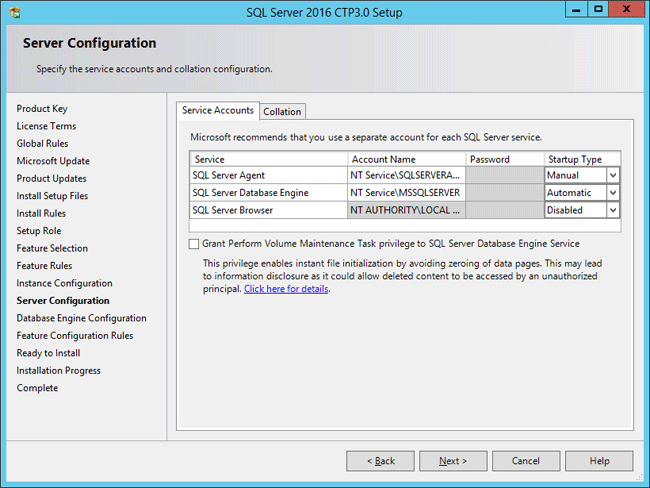 You can use the Start-Service cmdlet to stop your SQL Server service. Replace SQLEXPRESS with the instance name. 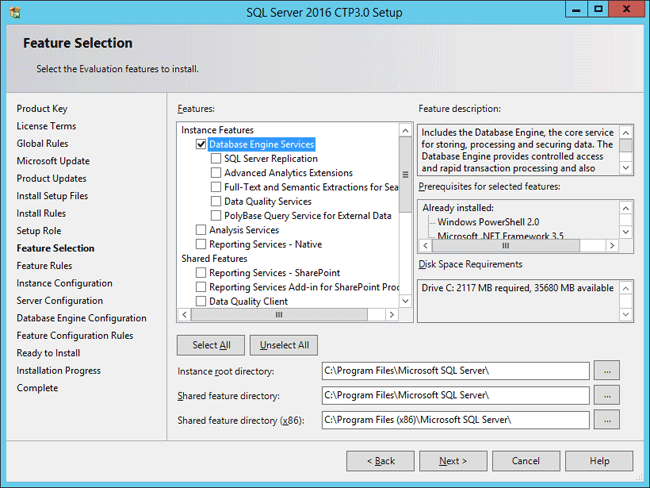 Or use the Stop-Service cmdlet to start your SQL Server service. Open SQL server Management Studio and connect to your SQL Server instance. 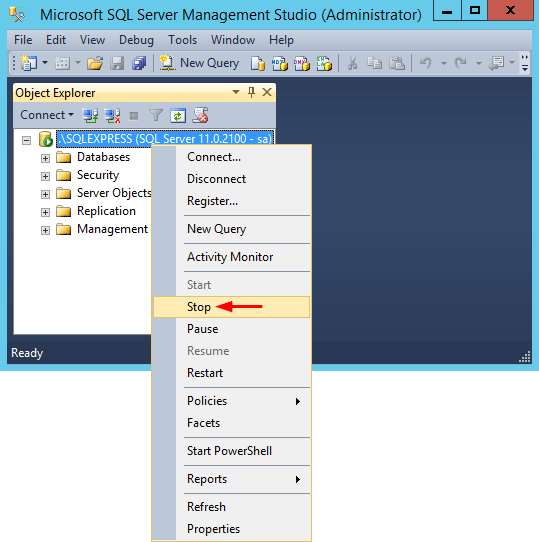 Right-click on the server in Object Explorer, you’ll have options to Stop, Start, Pause, Resume and Restart your SQL Server service. If we are not already connected, we can’t start a stopped instance. 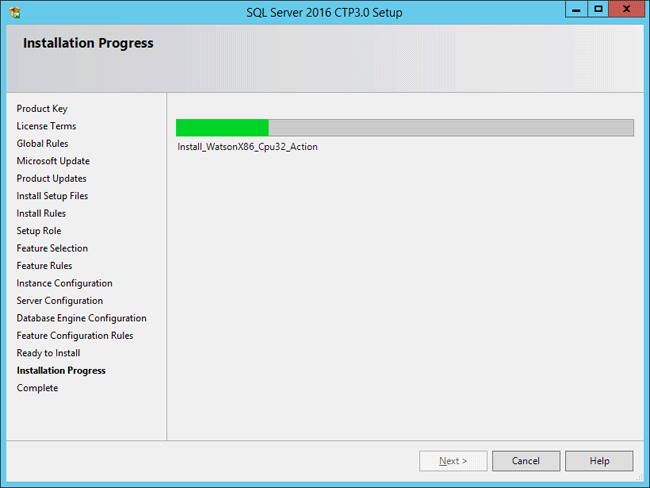 SQL Server 2016 Community Technology Preview 3.0 (CTP 3.0) was released to the public on 28th October, and I downloaded a fresh copy to start trying it out. 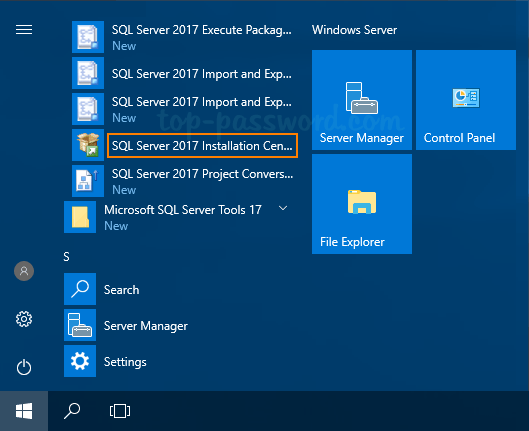 In this article I’m going to explain, step-by-step, how to install SQL Server 2016 CTP 3.0 instance on a Windows Server 2012 R2 system. Insert the SQL Server 2016 installation DVD. From the root folder, double-click Setup.exe and you’ll be greeted with SQL Server Installation Center. 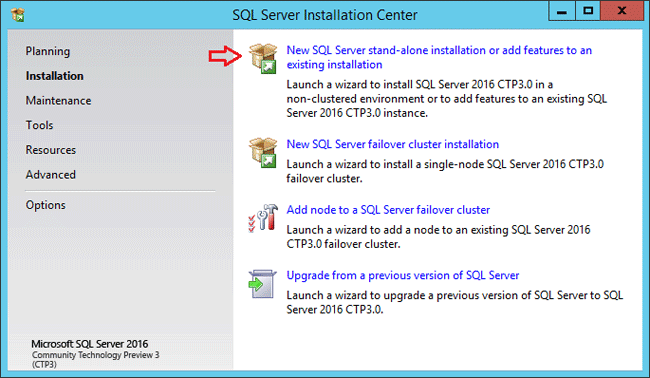 To perform a new stand-alone installation, click New SQL Server stand-alone installation or add features to an existing installation. Enter the product key and click Next. 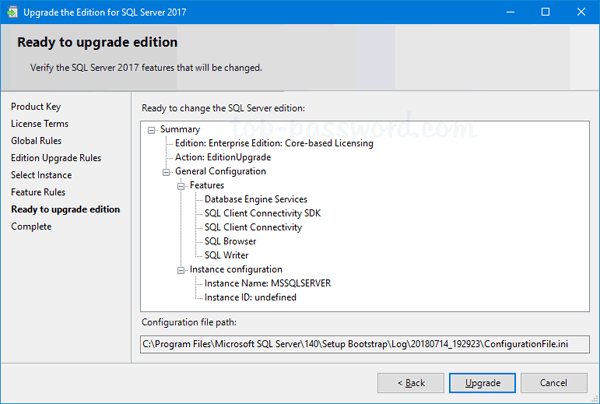 As the final version of SQL Server 2016 is not released yet, so just select evaluation edition. In the License Terms window, tick the box I accept the license terms and then click Next to continue. A new option appears here to use Microsoft updates if you would like to. 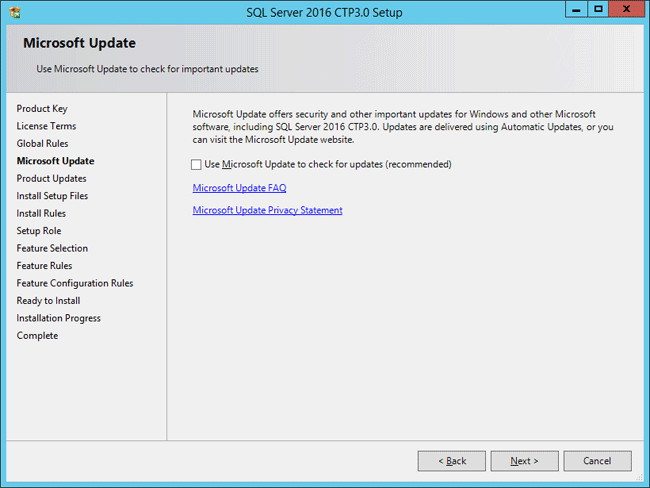 I keep it unchecked as I would patch SQL Server manually at the right time, after testing. Run the setup rules checks. I have a warning to tell me that the firewall is on and just ignore it if you haven’t configured Windows firewall to block SQL Server access. 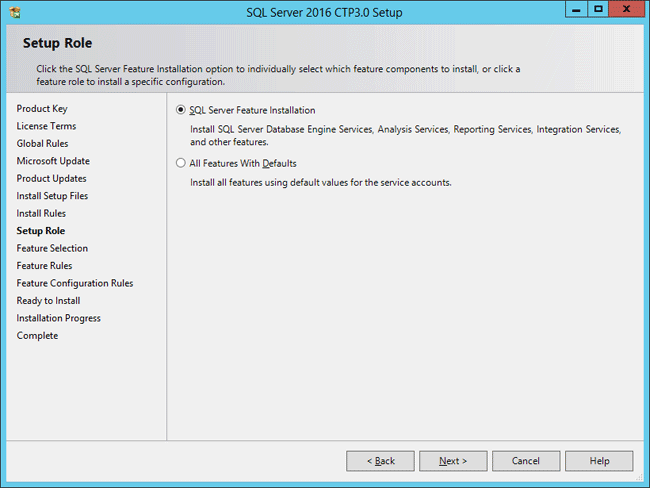 On the Setup Role page, choose SQL Server Feature Installation and click Next. 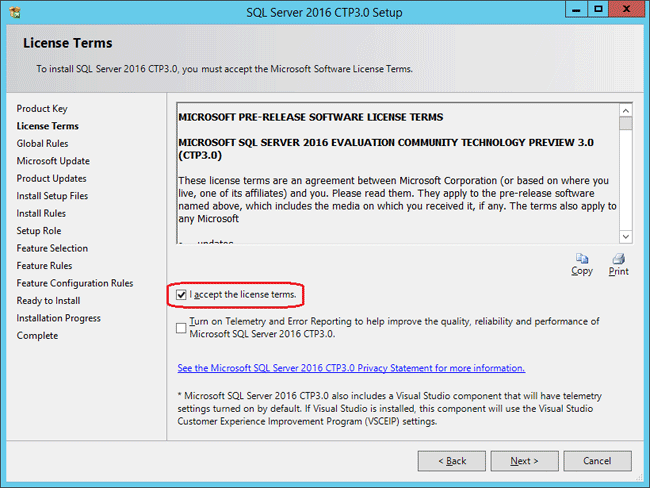 Select the required SQL features and click Next. Make sure that Database Engine Services is checked. 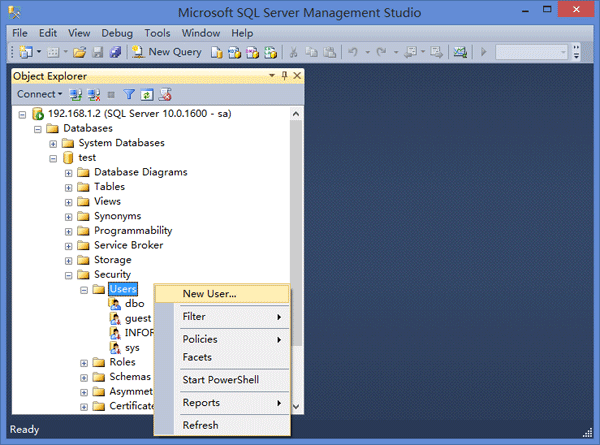 I have also chosen to install the Management Tools – Basic so I can use Management Studio to manage SQL Server. At this step another check will run, this time to identify problems that might block the setup, based on your choices of the last step. Just wait for its completion and click Next. This step lets you decide if you want to go with Default Instance or a Named Instance. Be aware that you can only install one default instance but you can install multiple named instances on the same computer. On the Server Configuration screen, you can specify the service accounts and startup type, or simply leave it at the default configuration as you can change them after the installation. 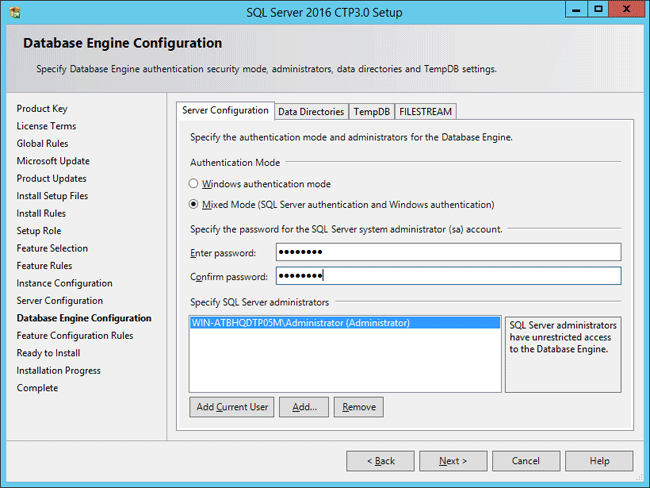 Now you need to choose the authentication mode of your SQL Server instance. For the purposes of this article, I will be choosing Mixed Mode Authentication. 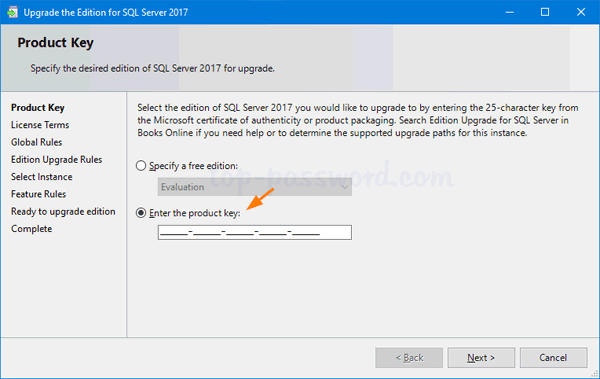 You will also need to specify the SQL Server administrators to be used; in this example I will use the current logged in user by clicking Add Current User button. This page shows a tree view of installation options that were specified during Setup. Review and click Install. The installation will begin — wait for completion. 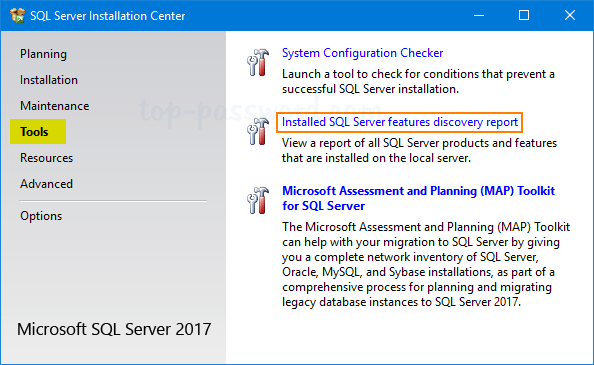 Once the installation is complete, SQL Server 2016 Setup will confirm this showing which items of the install succeeded. One of the most common error messages I come across when logging into SQL Server is error 18456: Login failed for user you provided. Can anybody tell me what the error code means? This generic message means that SQL Server is not able to grant you access, but this message is useless for you to determine the true reason for the failure. 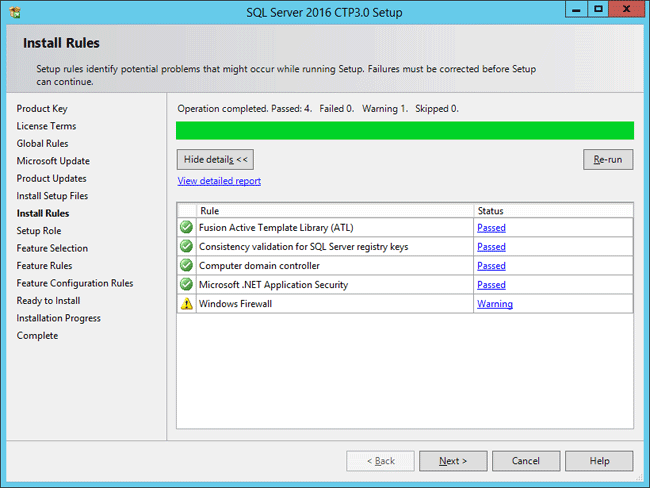 To troubleshoot the SQL Server login failure, we have to dig into the SQL Server error log and find the root cause of the issue. Typically, SQL Server retains backups of the previous six logs and gives the most recent log backup the extension .1, the second most recent the extension .2, and so on. The current error log has no extension. To check out what is happening on your database, you should check out the current error log file named ERRORLOG. It’s just a text file and you can open it with any text editor, such as Notepad. When you receive the login failure message (error 18456), just open the ERRORLOG file, browse to the end and you can find the corresponding entry related to your login issue. The key to the message is the ‘State’ which the server will accurately set to reflect the source of the problem. 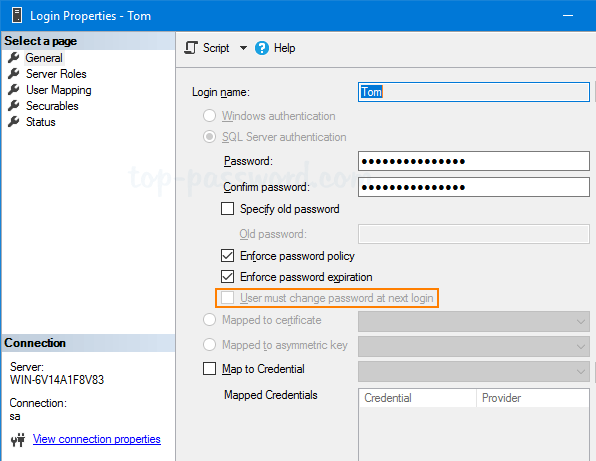 In the example above, State 58 indicates that you’re trying to login with a SQL Server account that’s not a supported authentication mode for your server. State 2 and State 5 Could not find a login matching the name provided. 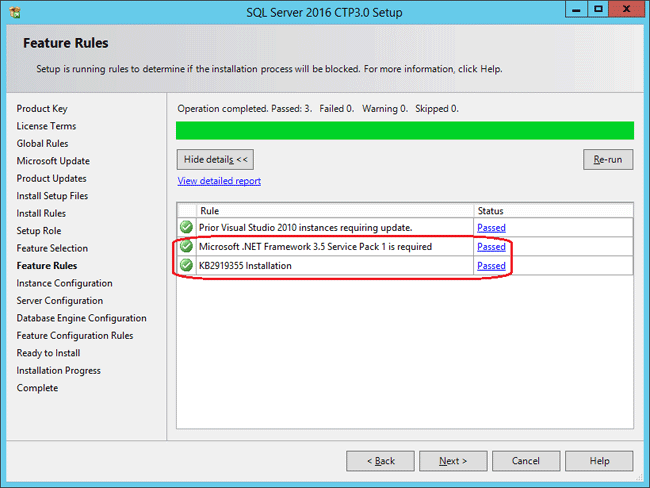 State 13 SQL Server service is paused. No new connections can be accepted at this time. State 16 A connection was successfully established with the server, but then an error occurred during the pre-login handshake. State 23 Access to server validation failed while revalidating the login on the connection. State 38, 40, 46 Failed to open the database specified in the login properties. State 50 Current collation did not match the database’s collation during connection reset. State 51 Failed to send an environment change notification to a log shipping partner node while revalidating the login. State 56 Failed attempted retry of a process tokenvalidation. State 58 An attempt to login using SQL authentication failed. Server is configured for Windows authentication only. State 65 Password did not match that for the user provided. 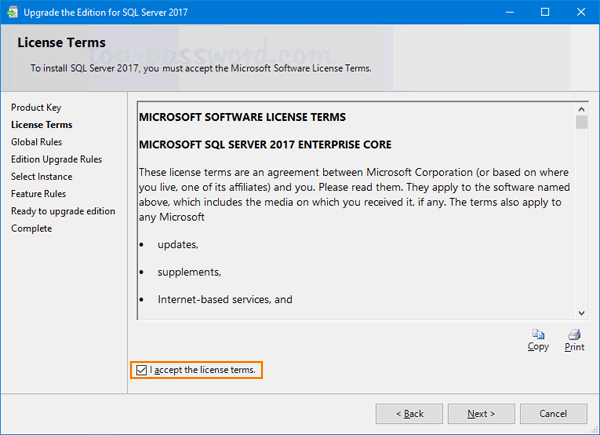 Although the words logins and users are often used interchangeably, they are very different things in Microsoft SQL Server. There has always been confusion over logins and users, especially for most new SQL Server users. 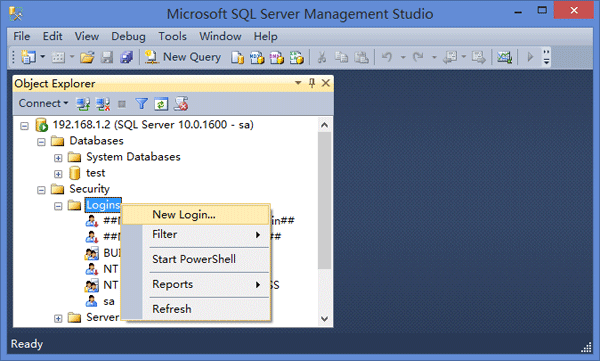 Here I’ll explain the difference between SQL Server logins and database users. Logins are created at the server level, while users are created at the database level. 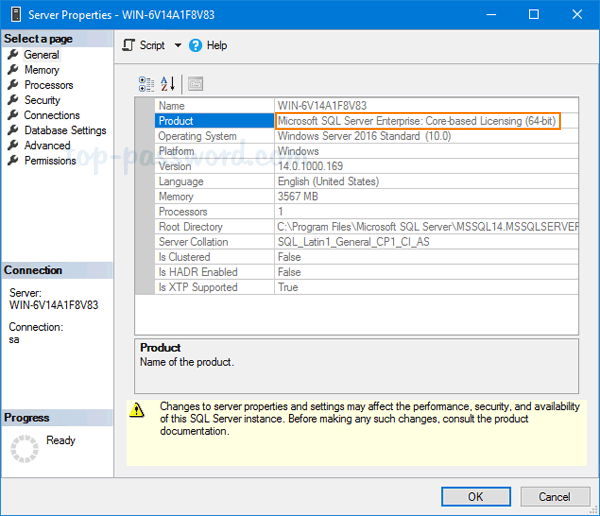 In other words, a login allows you to connect to the SQL Server service (also called an instance), and permissions inside the database are granted to the database users, not the logins. The logins will be assigned to server roles (for example, serveradmin) and the database users will be assigned to roles within that database (eg. db_datareader, db_bckupoperator). Logins must be mapped to a database user to connect to a database. 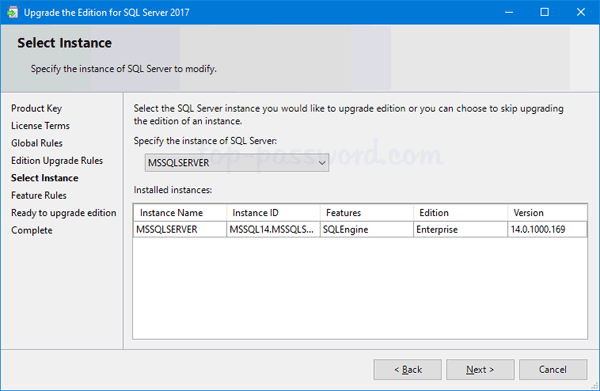 If your login is not mapped to any database user, you can still connect to SQL Server instance using SQL Server Management Studio (SSMS), but you’re not allowed to access any objects in the database. To access any objects in the database, you must have a login that’s mapped to a user in the database, and that user must be granted appropriate rights in the database. The database user does not have credentials of its own and relies on the server login for authentication. This means that there is no password associated with a database user. Below we’ll walk you through the steps of creating a new login and user, mapping a user to a login. 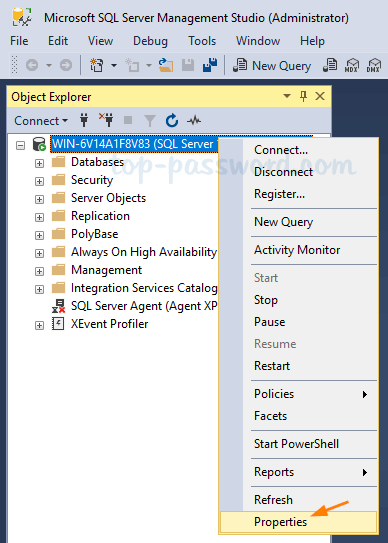 In the Object Explorer panel (located on the left side), expand the server where you want to create a new login. Expand the Security option, right-click on Logins and then select New Login. In the Login – New dialogue that appears, enter a new login name. 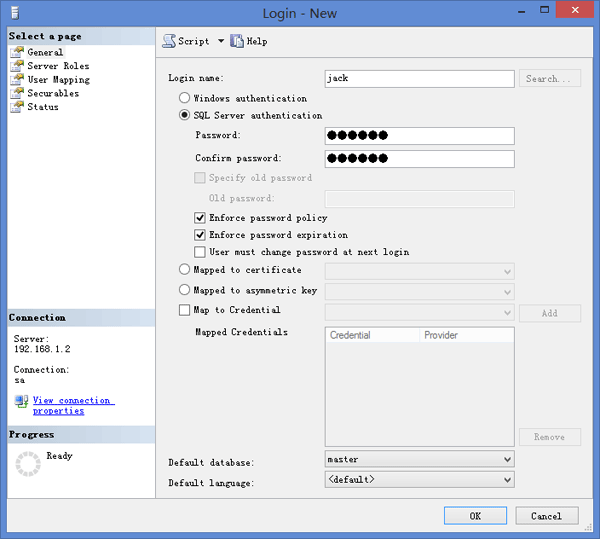 In this example, I create a new login named jack and choose SQL Server authentication. 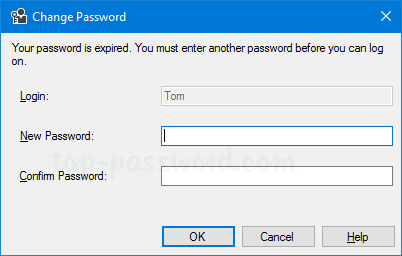 Uncheck the box labeled “User must change password at next login”. 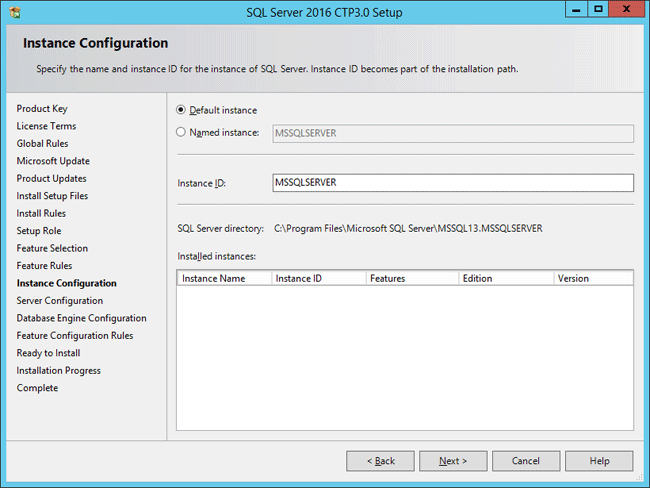 Click OK to create a new SQL Server login. Till now I haven’t set up User Mapping for the new login jack, so there is no database users mapped to this login currently. You can check out this at the Login Properties window by right-clicking the newly-created login and select Properties. 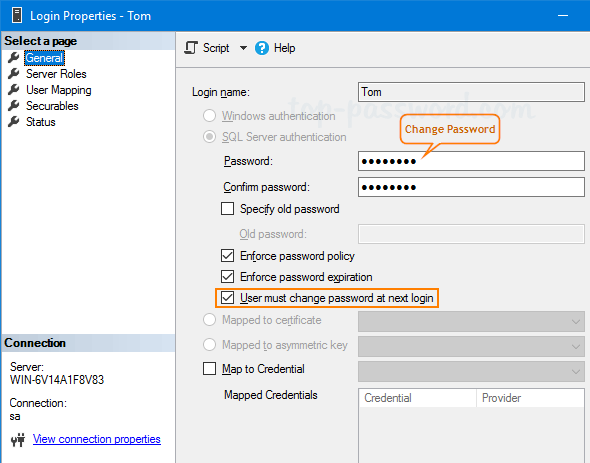 I can then use SQL Server Management Studio to connect to the SQL Server instance with this login. But when I try to expand the database test, I got the following error message due to lack of database permissions. In order to get access to a specific database, we need to create a new database user and map it to the login jack. 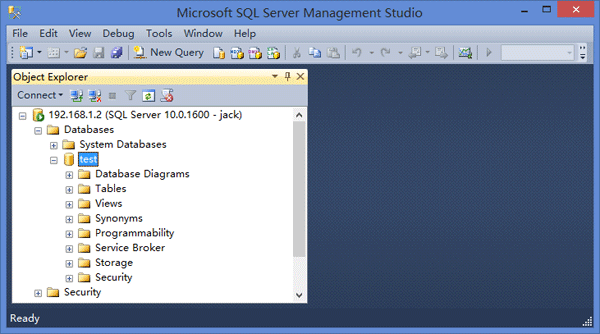 In the Object Explorer panel (located on the left side), Expand the database in which to create the new database user. Expand Security and then Users. Right-click on Users and then select New User. 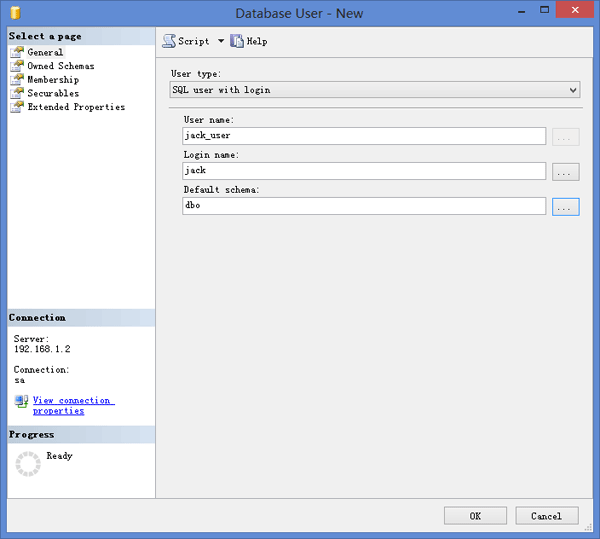 In the Database User – New dialogue that appears, select SQL user with login from the User type list, and enter a name for the new database user. 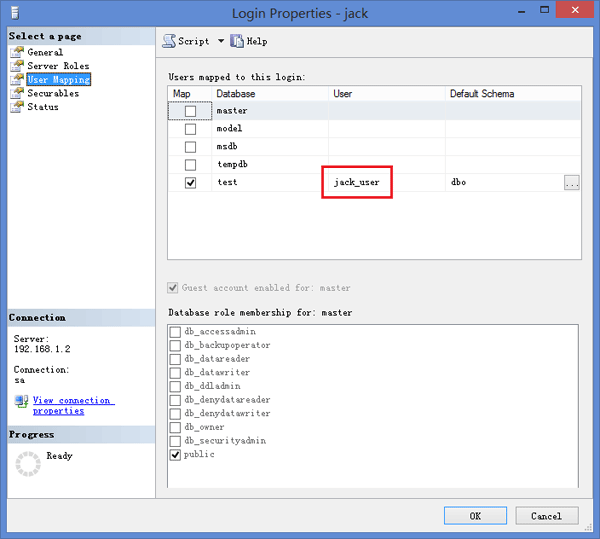 In this example, I create a new database user named jack_user, and set jack as the Login name as I want to map this database user to the login jack I created previously. 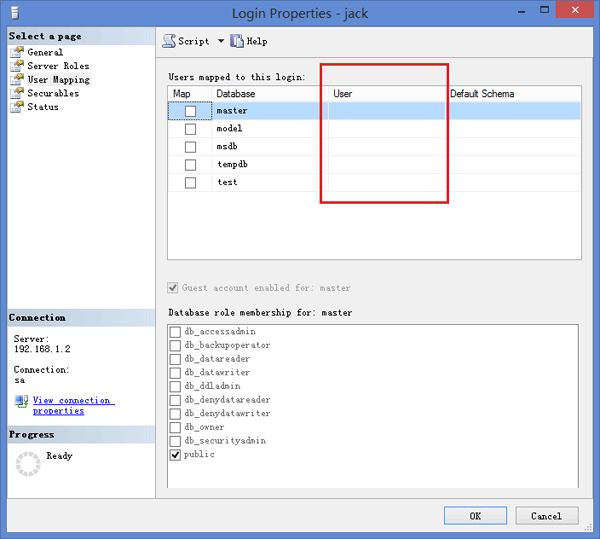 Once the database user is created, check out the Login Properties for the login jack and you’ll find the database user jack_user is now mapped to the login. 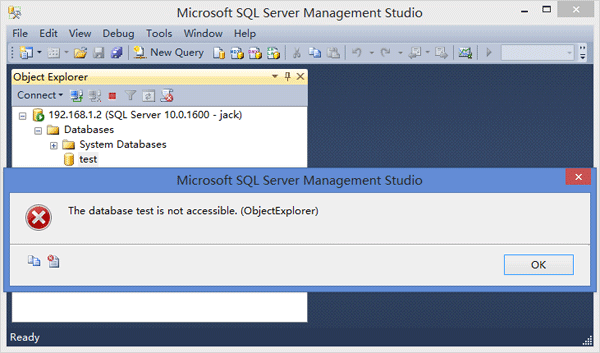 At this time you can connect to the SQL Server service with the login jack, and expand the database test without permission issue. That’s it! I hope this article would be helpful for you to understand the difference between a login and a user in SQL Server.